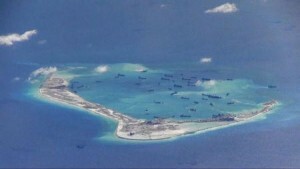 A Chinese warship sailed within yards of an American destroyer – forcing it to change course – in an “unsafe and unprofessional” encounter as the US vessel was in contested waters in the South China Sea, an official said on Monday. The USS Decatur guided-missile destroyer was conducting what the US Navy calls a “freedom of navigation operation” on Sunday when it passed within 12 nautical miles of Gaven and Johnson reefs in the remote Spratly Islands. During the operation, a Chinese Luyang destroyer approached the USS Decatur in “an unsafe and unprofessional manoeuvre in the vicinity of Gaven Reef in the South China Sea,” said Commander Nate Christensen, US Pacific Fleet spokesman. The Chinese ship then conducted a series of “increasingly aggressive maneouvres, and warned the Decatur to depart the area,” he added. “The US has repeatedly sent warships into the territorial waters near Chinese reefs and islands in the South China Sea,” it said. A trade war launched by Mr Trump has infuriated Beijing, as did his authorisation of a $1.3 billion arms sale to Taiwan, which China considers a rebel province. China has taken a series of retaliatory measures, including scrapping a US warship’s planned port visit to Hong Kong and cancelling a meeting between the head of the Chinese navy and his American counterpart. On Monday, a US defence official said that security talks due to take place later this month in Beijing between Defence Secretary Jim Mattis and his Chinese counterpart had been cancelled.